The BMW New Class of automobiles are considered as adorable boxy premiums. It was a generation of automobiles produced around 1962 and 1977 that has spawned the BMW 2002, which is treated as a must-have for the loyal BMW patrons. The New Class cars consists of models that include the 1500, 1600, 1800 and 2000 models- the last of which gave us the coveted 2002. 2002's powerful 2.0 L 4-cylinder engine and its lightweight features proved to be irresistible to many car enthusiasts. Moreover, it’s difficult to find these cars in good shape because there’s intense competition in getting the amazing models. The so-so models will require plenty of modifications to be considered at par. Now, the American comedian Jay Leno has brought this modded 2000 beauty in his garage. This particular BMW 2002 was made by the Bavarian Workshop, and the automobile was built for a certain customer who preferred to see their father's car restored back to its former glory. The automobile was not driven for many years, but nevertheless was in a good shape. This made it the perfect candidate to be modified. Marc Norris, the main builder, boosted the horsepower you will see from the stock engine and installed a more contemporary 2.3 L 4-cylinder engine that is reminiscent from a 1989 E30 M3. A 5-speed manual transmission replaces the 4-speed and aids the automobile to keep the revs to a minimum at highway speeds. Norris also installed 2002 Turbo fender flares that cover 16 inch wheels with some great wide rubber for the purpose of producing extra power. Also he added a strut brace and put on 5-lug wheels and Wilwood brakes. But not everything is smooth sailing, as Norris and Leno didn’t agree on the new stainless steel exhaust. 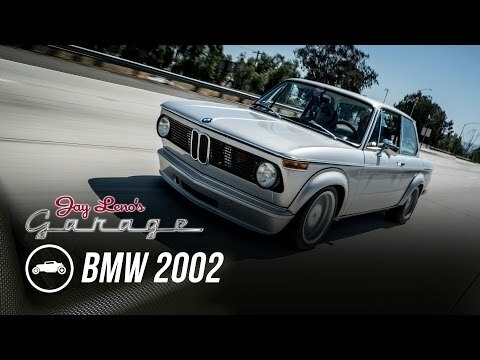 When the BMW 2002 is running, the note is considerably meek, but once Leno will get on the throttle, the exhaust will belt out a roar. Norris suggested that a resonator will be a good choice to not let the exhaust roar that much, but Leno strongly disagreed with Norris' recommendation. Not all parts have been modified, thankfully. Norris did not change the stock instrument panel in place, however he added altered seats from a 320i covered in nappa leather and finished out the trunk. But the M2 badge might not be everyone's cup of tea, though. The American comedian made a rather good argument on why this modded 2002 is the perfect example of a restomod. Per routine, the comedian takes a car for a cruise and we only assume he is having a grand time. With increased power that is combined with the decreased weight of the legendary car, this just has to be an awesome ride.